Labels 'Guanaham' or 'Cat Isle,' the first land sighted by Columbus in the Americas. This is an 1828 Anthony Finley map of the West Indies and Caribbean. 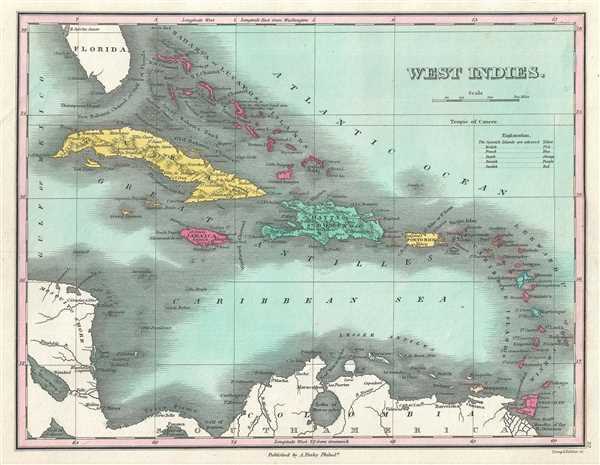 The map depicts the Greater and Lesser Antilles as well as the Bahamas and portions of the Spanish Main from southern Florida to Colombia and from Cuba and Nicaragua (the 'Mosquito Shore') to Barbados and the rest of the Lesser Antilles. All of the islands are colored according to their European colonizers. Cities, forts, bays, rivers, roads, and some topographical features are illustrated. In the Bahamas, Finley identifies 'Guanaham' or 'Cat Isle,' the first land in the Americas to be sighted by Columbus. Rumsey 0282.036 (1827 edition). Phillips (Atlases) 4314, 760, 752, 6045.